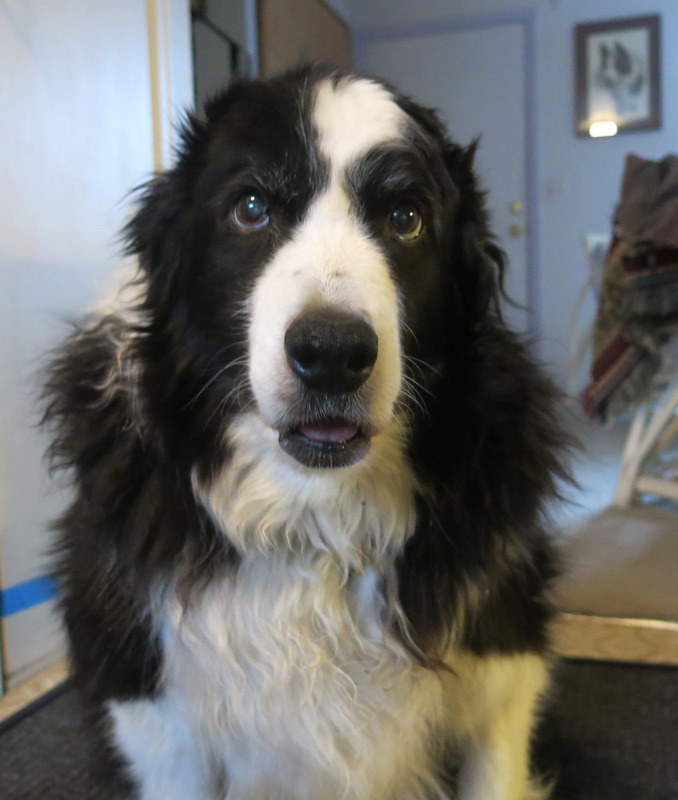 Greetings and salutations, everyone; yes, once again it is I, Chess the purebred border collie, filling in for the guy I live with, and here to bring you some rays of hope on this gloomy, snowy day. You may remember me from such hopeful posts as “Springing Forward, Hopefully”, among so many, many others. Here I am in a characteristic pose. You can see how I don’t show that I’m aware I have to go to see my doctor on Thursday, just to be looked at (and poked and prodded, but hopefully not stuck with needles). I am nothing if not stoic and totally tough, as you know. 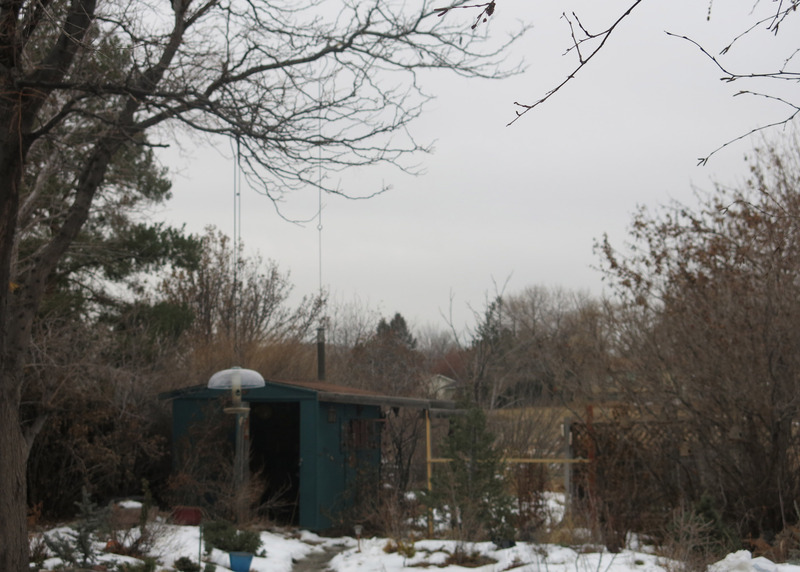 The day started out rather nicely but quickly deteriorated into gloom and then some snow. The guy I live with, of course, sprang into action. About one in the afternoon. They say it’s supposed to “nicen up” later this week, and maybe all the snow will melt, or at least the ice, which is no fun to walk on. The ice in the back yard has been sprinkled with sand, so I won’t slip on it. There wasn’t really much to say today, but then the guy I live with went out to the little shade garden on the north side of the house, and saw these “tiny rays of hope”. I think the snowdrop at the bottom of this next picture kind of looks like a dolphin. Very exciting. At least to one of us. 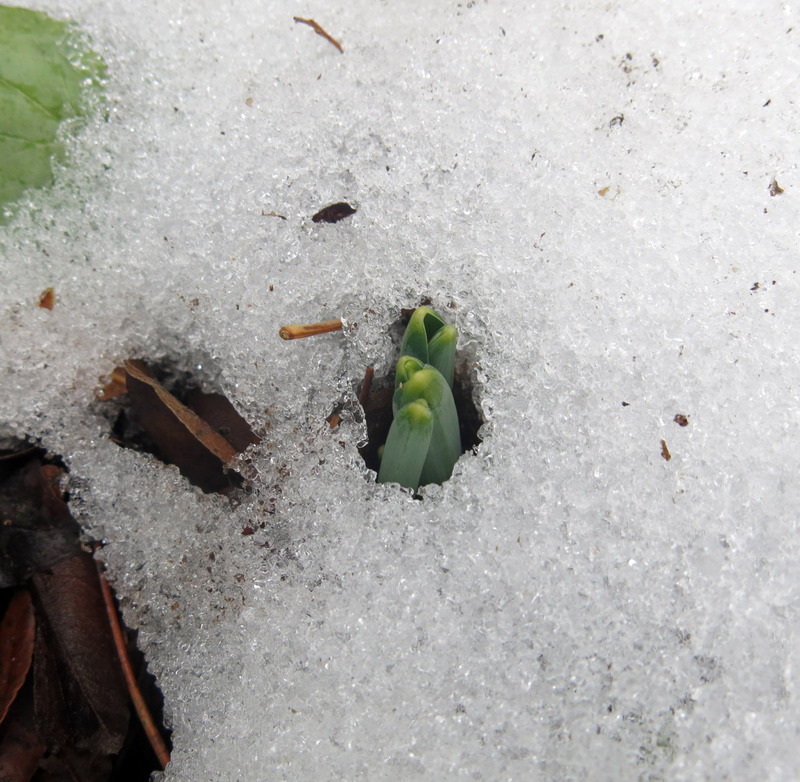 He says that maybe if it does “nicen up” later this week, there will be more snowdrops. That could very well be. I prefer to take things as they come. 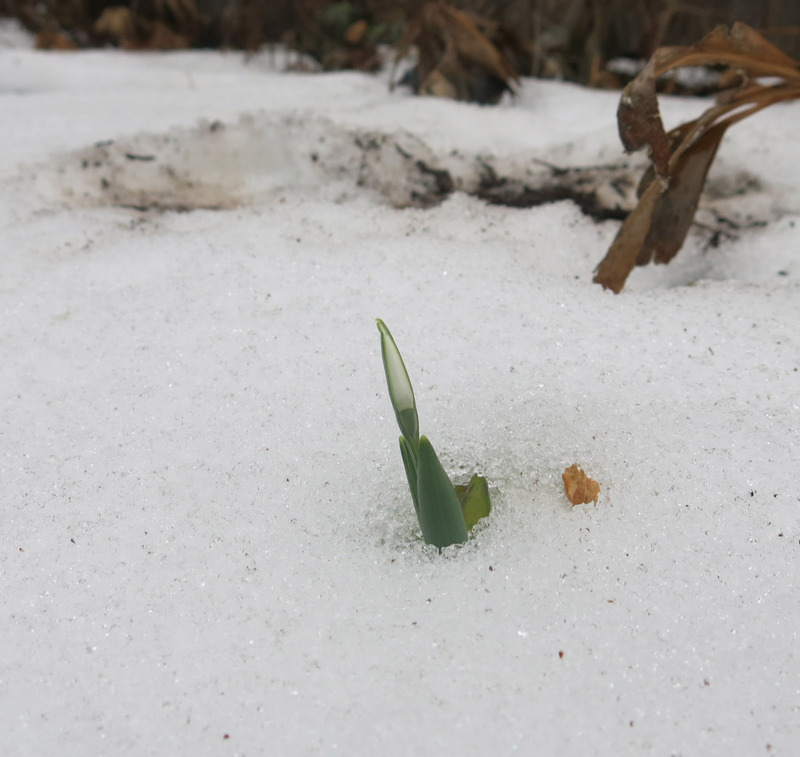 The snowdrops are a ray of hope in a very cold week here in NYC. I doubt ours are peaking through in the cold. Who is the handsome collie in the painting on the wall? Not that he has your sweetness of expression. Good luck at the vet. I’m sure that all will be well. We do like rays of hope. Winters here have become so long, ever since the winter of 06-07, when six feet of snow fell, in just two snowfalls, and all the snow and ice makes winter really, really boring (though good for plants nestled under the blanket of snow), so snowdrops are a welcome sight. I guess Denver itself has less snow on the ground than we do. That’s my Uncle Pooka on the wall; a pencil drawing that my mommy did. He had radar ears, as you can see. The guy I live with just called the vet to talk about me, and they said I hadn’t had an exam in a while, and so maybe I should get one, so I am. It’s nice to be looked after. I quite understand, Chess, rays of hope for the guy you live with are exemplified in those beyond cute snowdrops cresting through snow, especially the one you think resembles a dolphin (I do too). 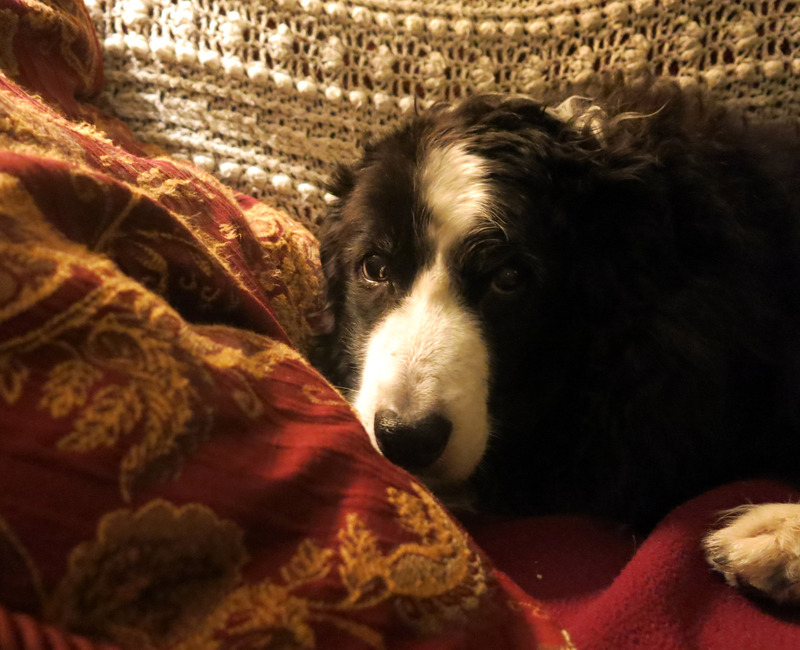 For you, Chess, on a snowy, gloomy day, well, look at yourself in your last photo, swaddled in beautiful old paisley and backed by a finely knit coverlet (how ever do you keep from snagging your toenails in the latter?) You have all that glory to return to after being called upon to endure your Thursday visit. Yes, in those circumstances, I’ll call your sofa a ray of hope. You are, after all, a tough, stoic dog who prefers his comforts and his brie. Thanks; I agree that I’m stoic and everything. It’s just that I haven’t wanted to do much walking lately, and the guy I live with thinks it’s my hind legs (he has the same problem with his hind legs, so he understands). I did get up on the couch all by myself. The one snowdrop does look like Flipper, faster than lightning, doesn’t it? The guy I live with remembers dolphins (we don’t have them here) at Marineland, a long time ago. The snowdrops look very much like dolphins. One in the afternoon is just about when I liven up and start to do stuff. Best wishes for good results at the vet. Thanks; I don’t go until tomorrow. Nothing seems to be wrong, my doctor said I hadn’t been squeezed and prodded in a while, that’s all. 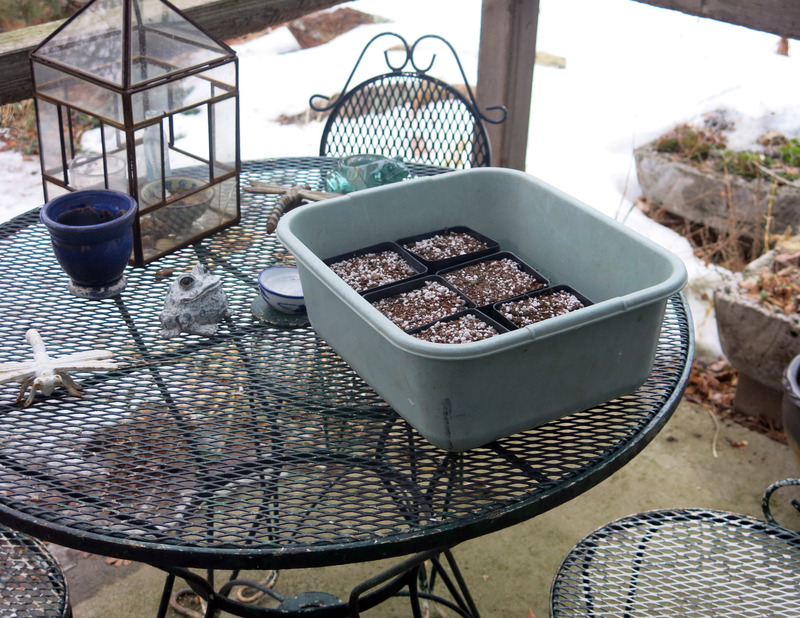 It was 60 today, with a warm wind, and the guy I live with did some gardening out in front, and then worked at chipping the ice off the garden paths in back, because if I walk out there I could slip. 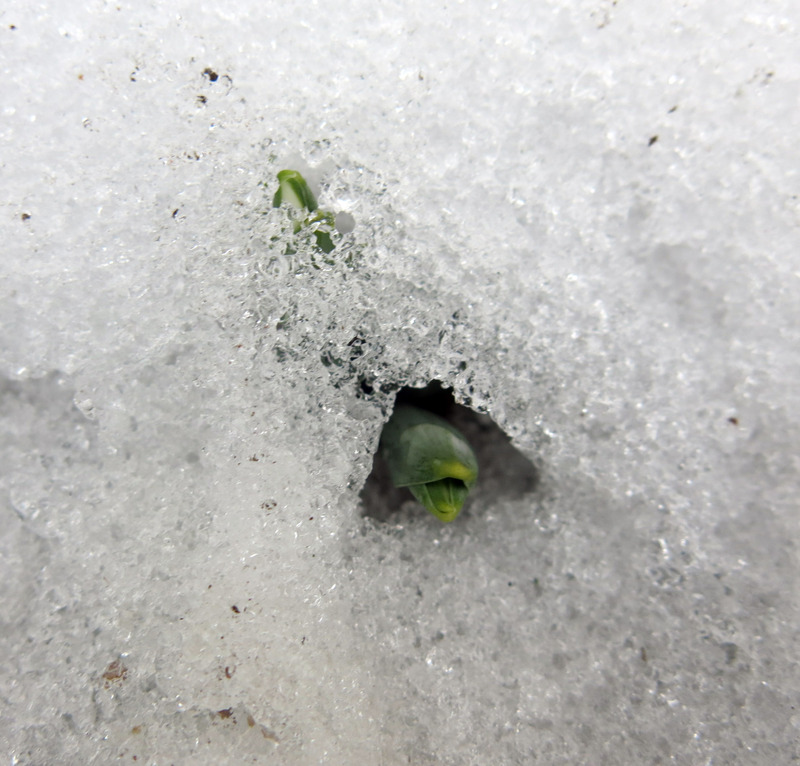 The snowdrop is blooming now, and there are bunches of others up.